Proposals to regulate breeding of cats for profit have been welcomed by Cats Protection, the UK's leading feline welfare charity. The Welfare of Cats Bill was introduced as a Private Members Bill to the House of Lords yesterday by Lord Black of Brentwood and supported by the charity. Currently, there is no legislation in the UK specific to the breeding of cats for sale, and if passed by Parliament the bill would improve the welfare of breeding cats and their kittens. • Inspection and licencing of cat breeders. • Banning licenced breeders from allowing cats to have kittens before they are one-year-old. • Limiting the number of litters bred from a female cat to one a year, and no more than three in her lifetime. • Ensuring kittens are well socialised and healthy before they are sold. After introducing the bill to the House of Lords on 24 July, Lord Black said: “I am delighted to be introducing into Parliament the first ever piece of legislation specifically designed to protect the welfare of cats. “Cats play a central role in millions of households, providing love and affection to so many families. It is vital the law protecting their welfare is up-to-date, modern and effective. But at the moment it isn't. “This Bill is designed to ensure that antiquated laws are modernised and that all cats - who give so freely of their love - receive the care and respect they deserve." Cats Protection is the UK's largest cat welfare charity and rehomes 42,000 unwanted and abandoned cats every year. The charity recommends cats are neutered at around four-months of age or younger to prevent the number of unwanted kittens being born. Cats are prolific breeders – one female can have up to 18 kittens a year – yet despite this the charity says there is a growing trade in highly-priced kittens being advertised for sale. 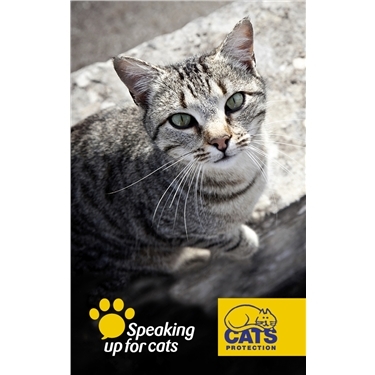 Cats Protection's Advocacy Manager Jacqui Cuff said the Welfare of Cats Bill was vital as although there is law governing the sale of pets it is outdated and dates back to the 1950s. She said: “New law is needed to protect cats from being bred and rebred for money as breeding machines. Repeated breeding is very draining and can be harmful for the mother cat. We know that the health and welfare of cats and kittens can be put at risk when there is a commercial interest in breeding for sale. “It is all too easy to carry on a cat breeding business behind closed doors, for example at a private residence. Where owners do breed their cats commercially, limits need to be put in place, for example on the frequency of litters and maximum number of litters any one cat can have in a lifetime. “It is not unusual to see ordinary cats advertised for high prices. We’ve seen 'gorgeous kittens' for £300 each and black and white kittens for £180. These high prices encourage cat owners to see cat breeding as a profitable business. “Sellers often refer to the same mother cat having had multiple litters. Some cat breeders are operating on a massive scale – we have examples of literally hundreds of kitten adverts from the same vendor over just a few months. For more information, a photograph or to interview Lord Black or Jacqui Cuff, please contact Michaela Phillips at Adastra Media on 07740 305918.